When we began looking into Luigi Romanelli’s story, we were surprised that there is no adequate biography of this important personality in Canadian musical life. It’s astounding that most people we ask have never heard of Romanelli, although he seemed to be always very active in many prominent areas. He led the best theatre and dance orchestras in Canada for over twenty years, made recordings and was a regular radio broadcaster, heard and well known on both sides of the border. He employed and groomed many of the Toronto area musicians of the next generation in several of his orchestras: “Trump” Davidson, Horace Lapp, Percy Faith, Johnny Burt, Nat Cassells, Gordon Day and Leslie Bell. So, we thought that we would like to help him to be better known. Incidentally, Luigi was called Louis by his family, but we’ll call him by his professional name, Luigi. We must emphasize here that there are still a few mysteries and unresolved discrepancies within our story, particularly in Luigi’s early years. Although we were unable to track his early violin teachers, to document his violin studies in Europe, circa 1903-1904, and his trip to Europe in 1918 for the Allen Theatre chain, we will continue to search. Joseph (Giuseppe) Romanelli arrived in New York in the early 1870s with his harp and his brothers, violinist Rocco and flautist Luigi. 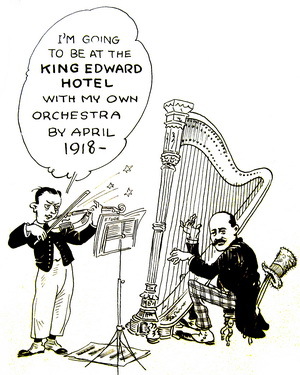 Later, Joseph toured with his harp and, between 1900 and 1910, toured and barnstormed with son Luigi. 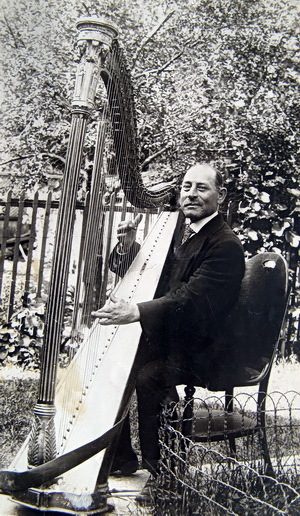 Joseph, pictured here circa 1932, was still giving harp concerts in the late 1930s, at age 81. Luigi’s father Joseph (Giuseppe) was born in 1858 in Venosa, 129 km inland from Naples, Italy. Joseph was a harpist and arrived in New York with his cat-gut-strung harp and his musician brothers in the wake of the Risorgimento. He came to Toronto around 1874 (TDS, Oct. 7, 1939, p. 3) and was educated there. The Romanelli boys were among the early Italian families to come to Toronto and, like many of them, music was a large part of their lives and their source of income. Joseph first turned up in Might’s city of Toronto Directory (MCTD) in 1883, a musician living at 98 Agnes Street, then at 43 Elizabeth Street with fruit dealer Louis Romanelli (a brother?) and in 1885 at 43 Teraulay (Bay) Street. Luigi’s mother Gaetana Maria (known as Kate) Potenza was also born in Italy, on November 15, 1862 and was brought to the United States around age one. We were unable to find documentation of her immigration, but we found her and her family listed in the 1880 U.S. Census as “Potenca”, living at 397 First Avenue, New York City. Son Leo’s belated birth registration in 1918 gives the marriage of Katie and Joseph as August, 1883, in Albany, New York (Prov. of Ont. Official Return of Birth #902518). 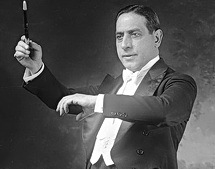 Joseph’s younger brother Rocco (c. 1869-1941) was an eccentric violinist, largely self-taught, who billed himself as “Romanelli the Great” and claimed he was 18 when he met Caruso in a bar in Toronto and then toured with him (TDS, Aug. 26, 1938, p. 21). That would date these events to the mid-1880s, when Caruso was a young teen and still singing in his hometown church. Rocco also talked about touring with Dame Nellie Melba, but not the slightest evidence has surfaced. Melba carried herself like royalty and it’s doubtful that she would ever have associated with a novelty fiddler. 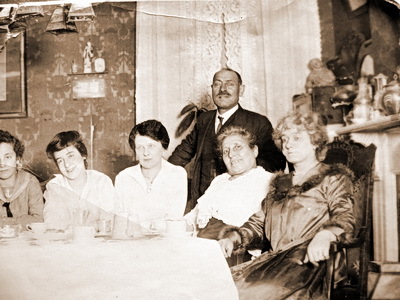 Rocco did direct orchestras in the U.S.A., met his future wife, Sarah Shaw of Wheatley, Ontario, on a trip to Detroit (Coulter) and lived in the Chicago area (USC, 1900, 1910, 1920). Another relative was Roxy/Romi Romanelli (born c. 1885), a Toronto-based jockey who rode St. Paul to win the King’s Plate (G, May 24, 1920, p. 14). A photo taken in the Romanelli home on Church Street, circa 1915, shows father Joseph (1858-1944) standing behind his wife, Katie (c. 1864-1926). The others in the photo are not identified. The Romanellis were living at 43 Elizabeth Street or at 43 Teraulay Street when Luigi was born, but his Declaration of Birth (sworn to and signed by his father on Sept. 12, 1932, when he was living at 78 Charles Street East; AO microfilm MS933_12) states that Luigi was born in Belleville, Hastings County, Ontario, on November 29, 1885. Later articles state that he began his violin studies in Belleville and made his first public appearance at age 7 (G, Jan. 28, 1931, p. 13). Joseph told The Star that he’d had ten children (TDS, Oct. 7, 1939, p. 3), but we found only nine: the oldest was Millie (Mildred Carmele; born June 6, 1884; she was a pianist, sang in opera and married Francesco Ungaro in 1924), then came Luigi, followed by Dannie (Dominick/Don; born Jan. 25, 1889 or Oct. 29, 1890), John (Giovanni Vincenzo; born Oct. 23, 1893) and Joseph (born Dec. 9, 1894; birth dates from Victoria School Registers, TDSBA; from birth certificates and CC, 1901). Lucy (Lucille Hilda, later Mrs. Henry del Greco) was born around December 4, 1900 (CC, 1901), Leo (Leo Clarence) on September 17, 1901 or 1902 and Irene Evelyn Lorrita (later Mrs. S. Freger of N.Y.) on April 6, 1907 (CC 1911), Another boy, Basiglio Popeo, born February 20, 1897, died in infancy on April 18, 1899. We found most of Luigi’s school record, from grades 1 to 6 (1891-1898) at McCaul School, where he was called Louis and was living at 45 Gerrard Street West (TDSBA). Luigi began his music studies with his father Joseph, first appeared playing the violin in public at age 7 in London, Ontario (LFP, July 30, 1942, p. 14; Fitch), and was earning a small living with his fiddle by the next year. We were unable to discover who any of Luigi’s violin teachers were, in Canada or in Europe, but they did raise him to the quality of a virtuoso on the instrument. On March 9, 1891, Mr. Romanelli of 45 Gerrard Street West registered both his daughter Millie, age 6, and his son Louis, age 5, at Victoria Public School near Yonge and Gould Streets. Millie was entered into Junior 1st (grade 1) in the autumn, and Louis entered Junior 1st the following autumn. At some point, Louis transferred to McCaul School at Elm and University but returned to Victoria on March 30, 1898, and we found the last record of him in school on September 9, 1899, going into Senior 3rd (grade 6). Luigi often said that, at age 12 (therefore, circa 1897-98), he appeared on stage with the young Gladys/Mary Smith, playing orphaned siblings in an amateur production in a theatre “near Toronto” (TSW, Sept. 10, 1932, p. 6; TDS, July 29, 1942, p. 2). Luigi once said that the play was “The Two Orphans” (Fitch), but the orphans in that old melodrama are two teen-aged girls. We worked diligently to find documentation for this production, but no records have turned up yet. Lou Skuce's mid-1930s fanciful cartoon of young Luigi playing on stage opposite the even younger Gladys/Mary Smith. They were apparently playing sibling orphans, probably in a tear-jerking melodrama, so it's not likely that they were attired in formal party costumes. There may have been other personal connections between the Romanelli and Smith families. The Romanelli family claimed that, at 45 Gerrard, they lived back-to-back with the Smiths - the house behind was 48 Walton Street (Goad) - and that Lucille was girlfriends with Gladys/Mary (Dante del Greco). This immediacy seems unlikely. For one thing, Gladys/Mary was almost 8 years old when Lucille was born. For another, it’s unlikely that the Smith children lived or spent much time close by. The MCTD does show her father, John C. Smith, alcoholic bartender, living at 81 Walton on the other side of Teraulay Street (Goad) in 1896 and 1897 and at 17 Walton in the last year of his life, 1898. His estranged wife (already calling herself “wid. John”) and three children lived on Agnes Street in 1895, on Adelaide West in 1896-97, on lower Spadina in 1898, at 73 Teraulay Street (Bay Street) near her sister Lizzie Watson in 1899 and 1900 and on Orde Street near Lizzie in 1901. They were always many blocks away from the Romanellis on Gerrard and the Smith children went to a different school. The old Ward was a small, fairly compact area, and poor working people moved quite often, so it’s entirely possible that the Smith and Romanelli families knew each other. 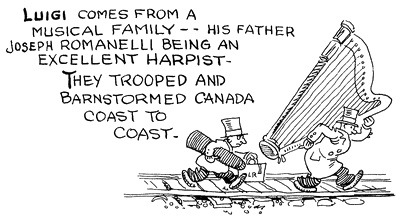 We did, however, discover another Smith connection with the Romanellis, in the person of a harpist who teamed up and toured with young Luigi (TSW, Sept. 10, 1932, p. 6). Frank Abate (1868-1953) roomed with Mrs. Lottie Smith (Gladys’/Mary’s mother) on Teraulay Street, 1898-1900, claimed to have been first to take the widow Smith and her family to the theatre, to have taught Gladys Italian folk songs and dances and to have predicted her fame. Almost 34 years later, when Abate managed to arrange to meet Gladys Smith again, as Mary the world-famous movie star, she appeared at the top of a staircase at the back of a Toronto theatre and came down the stairs doing one of the little song and dance routines that he had taught her (TDS, May 25, 1934, p. 1). So, Frank Abate could have been the connection. To try to sort out the Gladys and Luigi story, we tracked down Gladys Smith’s first mentions in Toronto newspapers (TDS, Nov. 20, 1900, p. 3; Apr. 2, 1901, p. 4), but could not document any stage appearance around 1897-98. Eileen Whitfield, the latest Pickford biographer, wrote that “Baby Gladys” did not get onto the stage until early 1900, when she was almost 8 years old, in the Cummings Stock Company production of “The Silver King” at the Princess Theatre in Toronto (Whitfield, personal communication; TDS, Jan. 8, 1900, p. 3). 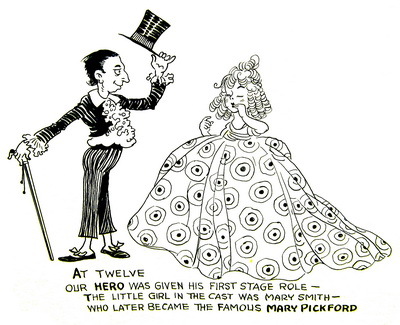 Gladys played two small parts in that production, and her younger sister Lottie had an even smaller non-speaking part (Pickford, p. 31; Whitfield, p. 25). On the second night, the Cummings took the show to nearby Hamilton, Ontario (TDS, ibid. ), and perhaps 6 year-old Lottie or other little children for the schoolroom scene could not go to Hamilton. Perhaps Frank Abate asked his young friend Luigi to help out by filling in - Luigi would have just turned 14 at that time - or it’s possible that Luigi was already in the orchestra of the Cummings Stock Company (Skuce) and for the Hamilton show was fished out of the pit and put onto the stage. “I played the violin and George danced. We performed outside of theatres, on street corners and on the ferry boats across Toronto Bay to Hanlan’s Point Ball Park. That was when we were first around 12 years old..... when we performed on the ferry boats, we made our money by passing the hat but, you see, really we were not supposed to be on the boat, so we had to hide from the captain..... One day, just before we reached Hanlan’s Point, I saw the captain coming down from the pilot-house. I was so scared that I jumped overboard and swam to shore, holding my violin up out of the water with one hand.” (Fitch). Once, when a tipsy listener dropped a $5 gold piece into the hat, the boys bought a bag of peanuts and adjourned with the change to the closest pool emporium. According to father Joseph, both Luigi and Don were pool-sharks and he had to shut them in their rooms and stand guard with a switch to force them to practice. Otherwise, he suggested, they might have turned out to be billiard champs instead of music directors (TSW, ibid.). Nearly forty years later, Luigi bested Rudy Vallee in a 13.5 hour pool session at Vallee’s Maine Lodge (TDS, Sept. 28, 1935, p. 13). Between 1900 and about 1912, documentation on the Romanellis is scarce, so we have not been able to verify the family stories. We do know that brother Don learned to play on Luigi’s first violin and that, as a child, Leo refused to go to sleep without the violin in his clasp (TSW, Sept. 10, 1932, p. 6). By 1901, around age 16, Luigi was listed in MCTD as a musician, and brother Dominick (Dannie/Don) too from 1908. At some point, Luigi toured with his father, and then added Don, for two violins and harp (Skuce; TDS, Sept. 10, 1932, p. 6). Luigi also recalled 11 months of “not so very pleasant” touring in the Ringling Brothers Circus Band, circa 1904. The circus visited Toronto, June 8 and 9, 1903 (TDS, June 6, 1903, p. 15) and it’s possible that Luigi joined or contracted to join then. Ringling Museum has no record of him, though CWM told us that, aside from the band, “there were aftershow concerts where a variety of music was performed and any instruments might have been possible on some shows at some time”. His daughter Betty told us that, when they were packing for summers at Murray Bay in the late 1930s, and her mother was folding the clothes in tissue paper, Luigi told them that the best way to keep clothes from wrinkling was to do what he did when with the circus, to roll them up (BRS). 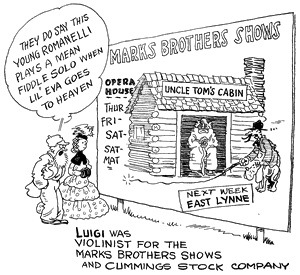 Luigi later recalled that he had played with the Marx Brothers “in their early stage” (TSW, Sept. 10, 1932, p. 6), though this gig was actually with the (seven) Marks Brothers Touring Company of Christie Lake, Ontario, in 1904 (TSR; EMC; Marks; ET, July 29, 1942, p. 17; LFP, July 30, 1942, p.14). Luigi did comment later on that Harpo was actually the talkative one at the time (TSW, ibid. ), which confuses the issue. The Marxes did not begin to coalesce until 1907, when Groucho, Gummo and Mabel O’Donnell formed “The Three Nightingales”, and Harpo joined in 1908. On the other hand, Luigi surely encountered those Marx Brothers in Toronto theatres. Leonard Marx (Chico) and Arthur Gordon appeared at Shea’s Yonge in 1910 (TDS, Sept. 19, 1910, p. 13) and Julius Marx (Groucho) recalled the brothers playing the Shea’s after the sinking of the Lusitania during WW I (Carnegie Hall). At some point, in Toronto in 1900 and/or in the U.S. circa 1906 (Skuce; EMC; TSR), Luigi played for the U.S.-based Cummings Stock Company. Cummings went defunct in Toronto in April 1900 (TDS, Apr. 27, 1900, p. 4), but the company was apparently back in business in the U.S. by July, 1903 ( RTD), so Luigi could have played for them in 1906. There is no independent documentation of Luigi’s tenure(s) with Cummings. Luigi said that he “went to London, England to complete his musical education....(and did)...his final studies in harmony..... in Belgium” (TSR; G, Jan. 28, 1931, p. 13; TDS, July 29, 1942, p. 2; TRL clipping file, Film F, N 5583, V. 303-11, envelope 2, cards 17-32), returning to Canada in 1906 (V, Aug. 5, 1942). He said that he then toured Canada as a solo violinist, 1906-12 (TRL clipping file, Film F, N 5583, V. 303-11, envelope 2, cards 17-32), again un-documented. Frank G. Wainwright recalled in 1934 that Luigi had played in his dance band 20 years before (TDS, Jan. 3, 1934, p. 8). The MCTD, however, showed Wainwright as a musician earlier, from 1909-11, so Luigi may have played for him occasionally, during his touring years. Nephew Dante del Greco told us that Luigi had studied violin with Luigi von Kunits (pupil of Grün and Sevcik) from 1909, but von Kunits arrived in Toronto only in 1912. Murray Ginzberg (TLTP) says that Luigi studied with Jan Hambourg (pupil of Wilhelmj, Sauret, Hikeerman, Sevcik and Ysaye). If in Toronto, that can have been no earlier than 1910 (TBH, p. 79). Was a violinist and assisted in conducting the Romanelli orchestras. At the Circolo Colombo reception after Don married Eva Bartello, the provincial police arrived to investigate the refreshments and the couple was toasted with water. Luigi appealed to the legislature, which conceded that the wine might be consumed at private homes only. Youngest brother Leo studied violin with Luigi von Kunits, played in Romanelli’s orchestra and was also a conductor. He married Miss Rita Garbarino. 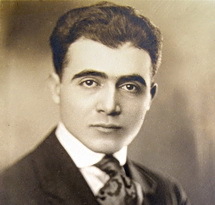 Was born in Alatri, near Rome, Italy, circa 1894, emigrated with his parents to New York in 1895, was a clarinetist with Sousa’s Band and with d‘Urbano’s Band at Scarboro Beach Park (c. 1914), and later violinist and concert conductor in Toronto. He married Lucia Romanelli in Toronto in 1922. The MCTD listed Louis Romanelli, musician, living with the family at 45 Gerrard Street West from 1907, and from 1910 at 607 Church Street. In 1911 and 1912, he was “musician, Shea’s Theatre”, which confirms his account that his first years in the orchestra pit of a Toronto theatre were spent at the then new Shea’s at Victoria and Richmond Street (TSW, December 10, 1932, p. 6), part of a 12-piece orchestra under Shea’s veteran music director Augustus G. “Gus” Nauman (TW, Aug. 1, 1910, p. 2; TW, Aug. 2, 1910, p. 7). After that, he was in the pit orchestra at the Majestic Theatre “of golden memory”, which featured “refined vaudeville and the latest motion pictures” at 25-27 Adelaide Street West (TSW, ibid.). 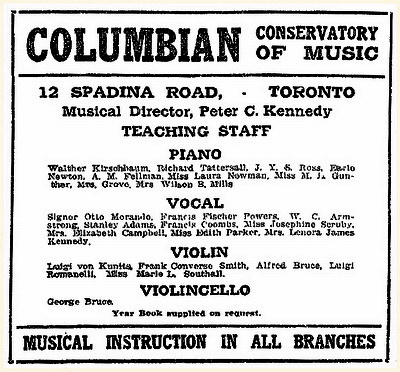 Luigi Romanelli was briefly part of the violin department, headed by Luigi von Kunits, at the Columbian Conservatory of Music, Spadina Road just north of Bloor Street, Toronto. Soon after, the Columbian became the Canadian Academy of Music, Col. A.E. Gooderham, President. 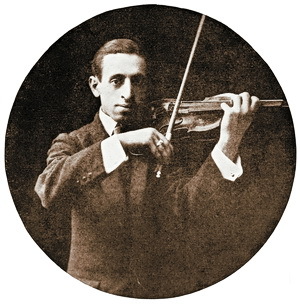 Later that year, Luigi Romanelli was among the first violins of the Toronto Symphony Orchestra under Frank Welsman (1st program, 8th season, Oct. 30, 1913). At the time of his visit to cousin John Zitto in Saginaw, Michigan, August 14, 1912, Louis Romanelli was registered as musician, of dark complexion, 5’ 5” tall with brown hair and brown eyes (ALE). He declared this to be his first visit to the U.S.A., but he must have been there before with Cummings Stock and Ringling Brothers. We found Luigi as one of five in the violin faculty of the Columbian Conservatory of Music (re-named the Canadian Academy of Music in February, 1913), headed by Luigi von Kunits (TDS. Nov. 23. 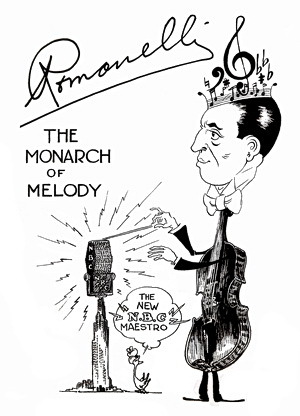 1912, p. 4), and advertising by business card in the Toronto Symphony Orchestra program of January 23, 1913: “Luigi Romanelli, Violinist, studio Columbian Conservatory of Music”. 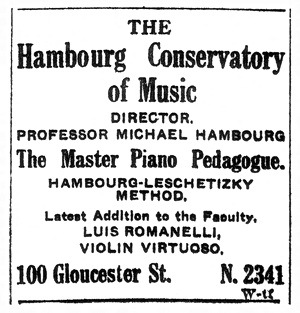 Two months later, the young Hambourg Conservatory of Music on Gloucester Street advertised its “Latest addition to the Faculty, Luis Romanelli, Violin Virtuoso” (TSW, March 22, 1913, p. 11). He was a good enough player to be in the first violin section of the 1913-14 Toronto Symphony Orchestra under Frank Welsman (1st program, 8th season, Oct. 30, 1913; Baldwin Room, TRL), from October 20, 1913 to March 26, 1914. The orchestra was not re-constituted after the outbreak of war in the fall of 1914 and did not re-form until the 1917-18 season. According to the family, Luigi realized that he could make a much better living playing popular music and adopted the “popular touch” (BRS), probably around this time. The original Shea’s Theatre on Yonge Street was rebuilt in 1911 as the Strand, and the theatre was remodelled in 1914 into a perfectly ventilated “Shady Nook”, with a new $15,000 pipe organ and space for a pit orchestra (TSunW, May 24, 1914, pt. 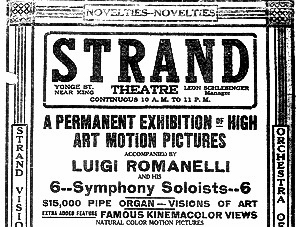 2, p. 7).“The Strand Symphony Trio.....including solos on the Violin, Cello and Pipe Organ” appeared on the Strand bill for the week of July 27 (TSW, July 25, 1914, p. 21). With the seventh installment of the photoplay “Million Dollar Mystery: The Doom of the Auto Bandits”, the theatre boasted “The Strand Symphony Trio, under the direction of Luigi Romanelli will discourse music several times daily throughout the week, their repertoire including organ recitals as well as violin and ‘cello solos and combined orchestration” (TSW, Aug, 1, 1914, p. 23). Mr. Roland Todd was the organ soloist (TSW, Aug. 8, 1914, p. 21). Soon, it was “A Permanent Exhibition of High Art Motion Pictures accompanied by Luigi Romanelli and his 6 Symphony Soloists” (TSW, Sept. 5, 1914, p. 21), later the “Finest Music in Canada by Luigi Romanelli and his Symphony Seven” (TSW, Apr. 1, 1916) and finally “Music by Luigi Romanelli and His Famous Strand Orchestra” (TSW, Apr. 29, 1916, p. 23). On the Fitch Bandwagon program, he recalled seeing Beatrice Lillie on stage at the Strand Theatre, playing the “Sextet from Lucia” on the piano with her left hand. Since we may have found Bea Lillie arriving in Liverpool, July 14, 1913 (ALE), before Luigi was engaged at the Strand, it’s more likely that this now untraceable show was at Shea’s on Victoria or at the Majestic. Luigi’s Strand credits continued until early 1917 (TSW, Jan 6, 1917, p. 23) and, by July, one-time TSO second violinist Ernest Knaggs had taken charge (TSW, July 28, 1917, p. 19). In September, Luigi led a large orchestra and chorus in Capocci’s Mass, for the Feast of St. Rocco at Our Lady of Mount Carmel Church on St. Patrick Street, and he also played his violin during the offertory (TDS, Sept. 17, 1917, p. 9). Luigi turned up next directing a large orchestra before a capacity audience for the grand opening of the newly built Allen Theatre at Richmond and Victoria Streets, Toronto (TDS , Nov. 10, 1917, p. 2). 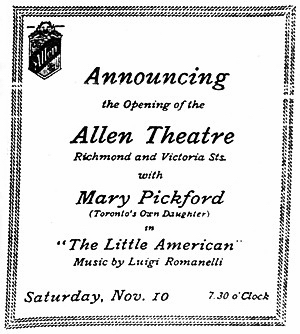 The film-play “The Little American”, with references to the Lusitania and the execution of Edith Cavell, starred Mary Pickford and the musical part of the program, featuring a large orchestra under Romanelli “came in for a great deal of praise” (TDS, Nov. 13, 1917, p. 13). For some films, such as Pickford’s “M’Liss”, Luigi played violin solos (TDS, May 29, 1918, p. 12). He spent a week at the 44th Street Theater in New York City studying the musical setting and critical timing for accompanying D.W. Griffith’s “Hearts of the World”, in preparation for the Toronto showing (TDS. July 25, 1918, p. 10), to start at the Allen on July 27th with a 30-piece orchestra. The Allens then sent the film, Luigi and 40 musicians out to the area military hospitals (TDS, Aug. 8, 1918, p. 18). “Toronto may proudly boast of several orchestras of a very high calibre in the leading picture theatres of the city. Luigi Romanelli, at the Allen theatre, has an excellent body of men under his baton, whom he directs with elegance, with a fine temperamental abandon and with an unusually delicate sense of shading and phrasing” (CJM, 1918). 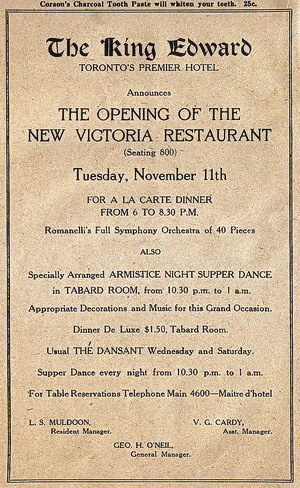 Full page advertisement for the opening of the new Victoria Restaurant at KEH, November 11, 1919, featuring Romanelli’s full 40-piece symphony orchestra. We could not find any contemporary documentation of the story that he was sent to Europe in 1918 to research music for the Allen Theatres (G, Jan. 28, 1931, p. 13; ET, July 29, 1942, p.17 ) and that, on his return, Romanelli was charged with management of the music for the Allen Theatre chain across Canada (TSW Sept. 10, 1932, p. 6). “Ah, to be invited to the King Edward Hotel with Romanelli spinning silky whispers of love with his violin. As I recall, the tab was 50 cents per, so you had to have a beau with a dollar to throw away on such frivolity. And you danced and danced and danced, and sipped tea and ate sandwiches and small cakes, and it was divine.....” (TDS, Jan. 29, 1977, p. E32). Somehow, Romanelli managed to dovetail his musical interludes at the Allen and the dances at the nearby King Edward. 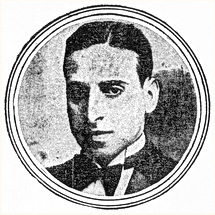 With Allen’s Premier Concert Orchestra he would direct popular overtures and operatic excerpts between and supply the atmosphere for the photoplays, though sometimes Leo, Don or brother-in-law Henry (Enrico) del Greco would direct (TDS, Dec. 4, 1920, p. 8). Saxophonist Nat Cassells recalled in 1992 that he and top musicians Jack Curry (piano), Cecil Figelski (violin), Ben Seth (bass), Larry Cortese (harp) and Gene Fritzley (drums) were invited to play for Luigi’s sister’s wedding, circa 1921, and then for the Oak Room, as the original KEH Orchestra (TLTP, p. 25). That wedding might have been Lucy’s to Henry del Greco (TDS, Aug. 31, 1922, p. 18). The personnel was, from left: violinist and leader Luigi Romanelli, violinist Cecil Figelski, pianist Jack Curry, saxophonist Nat Cassells, harpist Larry Cortese, drummer Gene Fritzley and bassist Ben Seth. NYT New York Times, New York, N.Y.
WSJ Wisconsin State Journal, Madison, Wisconsin, U.S.A.
Mrs. Betty (Romanelli) Sanford; Dante del Greco; Joyce Romanelli; Joe Moore, Suffolk; Gerald Fabris, Museum Curator, Edison National Historic Site, West Orange, N.J.; David Lennick, Jack Litchfeld, Mike Batch, Wayne Plunkett and Bill Pratt of CAPS; TDSB Achives; staff of the Baldwin Room, Toronto Reference Library; Eileen Whitfield; Murray Ginzberg; Ringling Museum of Art; Circus World Museum; June Coulter of Wheatley, Ontario; Pat Temple of the Elgin County Branch of the Ontario Genealogical Society in St. Thomas; Lisa Rae Philpott of the Music Library at University of Western Ontario; staff of Mount Hope Cemetery, Toronto; Toronto Symphony Archives; Brian Quinn of the Royal Conservatory of Music; University of Toronto Music Library.